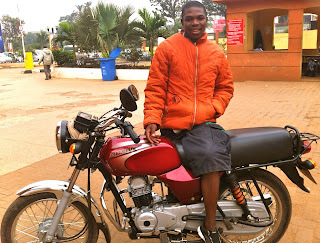 Bodaboda Baby: You say...one glove, one life... 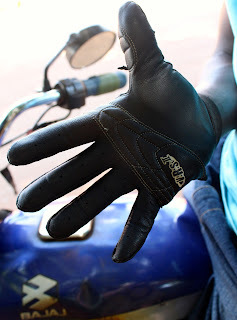 The latest trend in handwear for bodas. You say...one glove, one life... 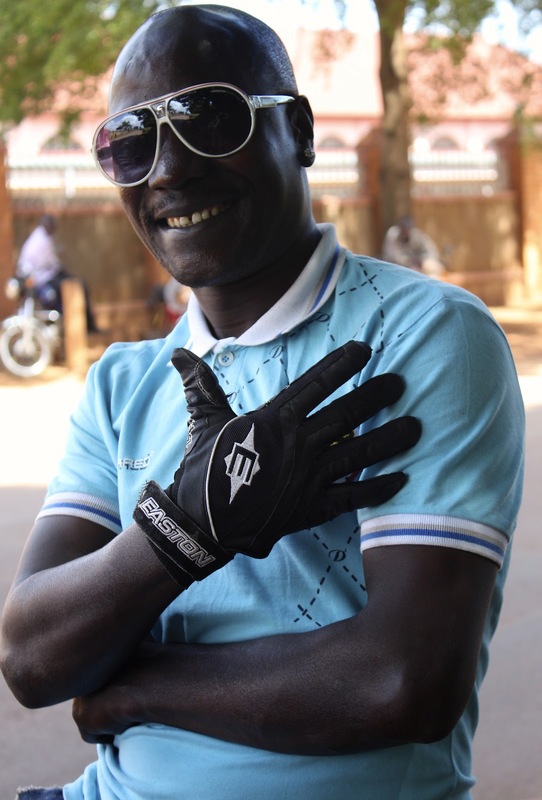 The latest trend in handwear for bodas. 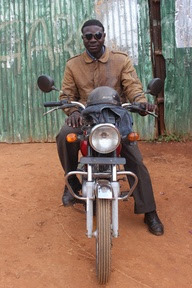 My regular Garden City boda, Mike. 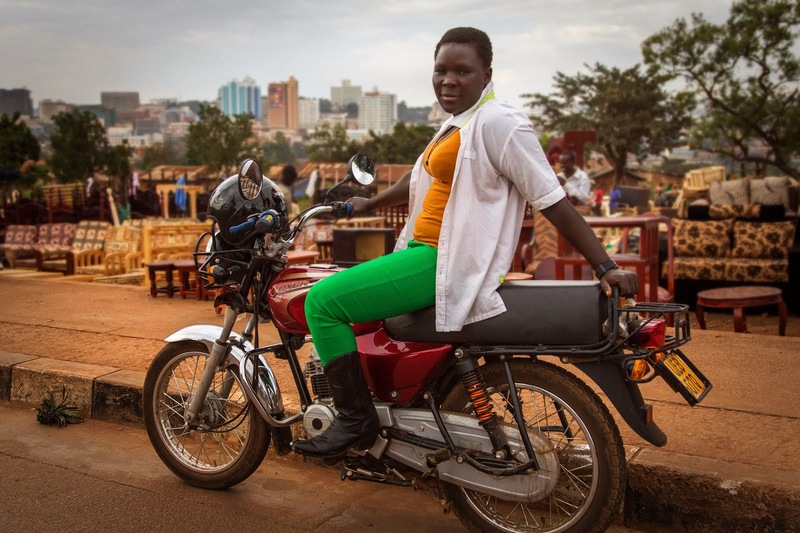 Bodaboda Baby hates to allude to Bono's music in one of her posts, especially in Africa of all places, but when Mike, one of her regular Garden City bodas, picked her up on Saturday afternoon to take her to Pope Paul VI Memorial Hotel for the national chess championships he was wearing one glove. One glove, only. 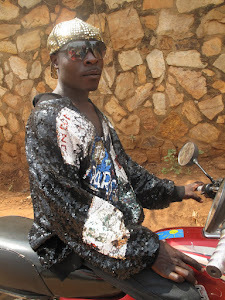 Yes it seems the one-handed look, a move which could perhaps be described as Wacko Jacko meets Helena Bonham Carter, is the latest trend for boda riders although it's driven (no pun intended) by supply over style, and not the other way around. The chess championships at the Pope Paul VI Memorial Hotel on the weekend. "It's (for) protecting my hand," explains the softly-spoken Mike, speaking about his recent purchase to yours truly at The Coffee Bar, a new cafe in Bugolobi which includes the mysterious "muphins" on the menu. 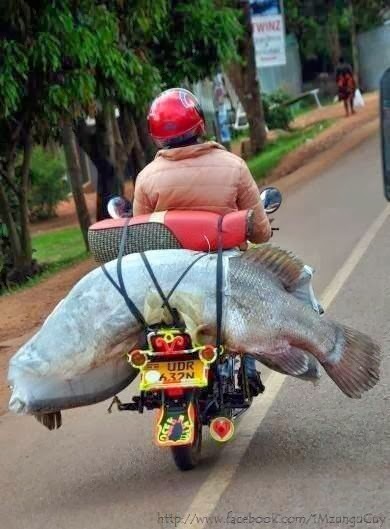 "Actually it is my friend who told me to buy it. He said you have to go downtown and look for it. Others have (one), others don't. It's a nice glove. I feel so comfortable." There it is...Close-up shot of THE glove. Of course Mike had initially been on the hunt for his one glove's partner. 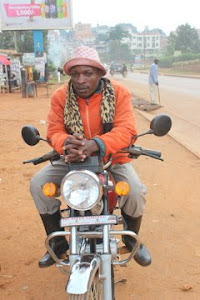 But when he turned up at Owino market a seller told him he was dreaming. 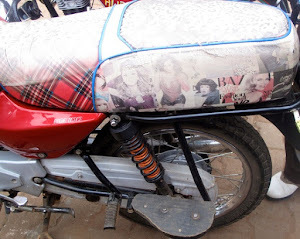 "It was one on its own because they come in secondhand from somewhere (maybe England). 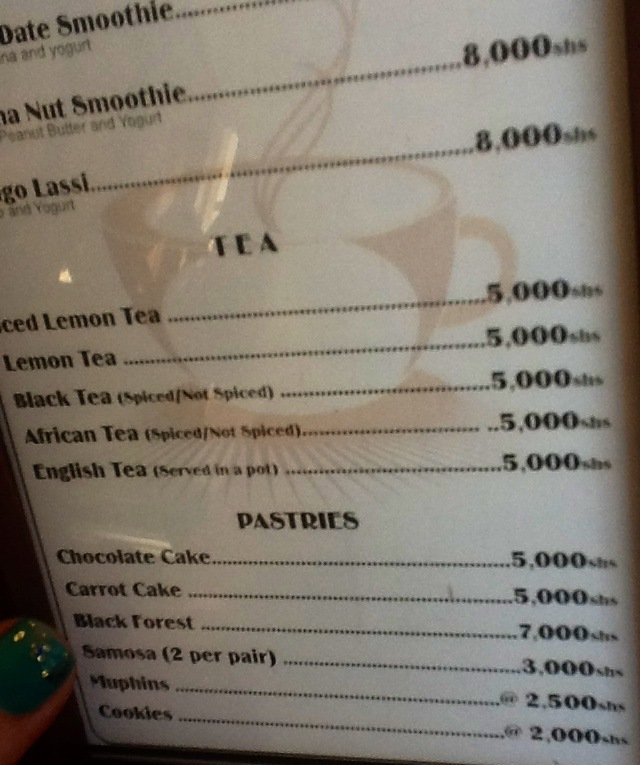 So I bought it for 10,000 shillings ($3.86 USD). 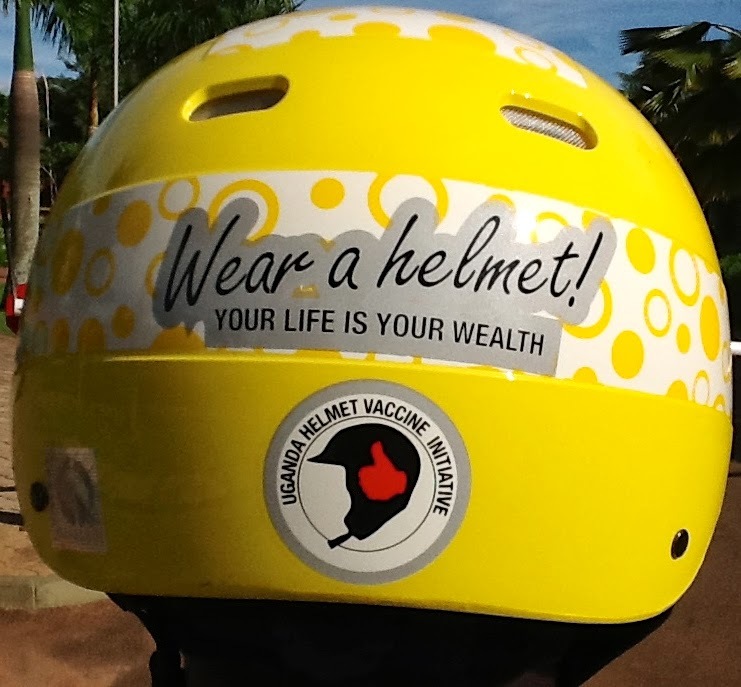 I'd like to get a pair," the rider says. Proving that boda drivers can also do maths, Mike adds: "I'm going back on Saturday and I'm going to look for two, so it will be 20k ($7.72)." 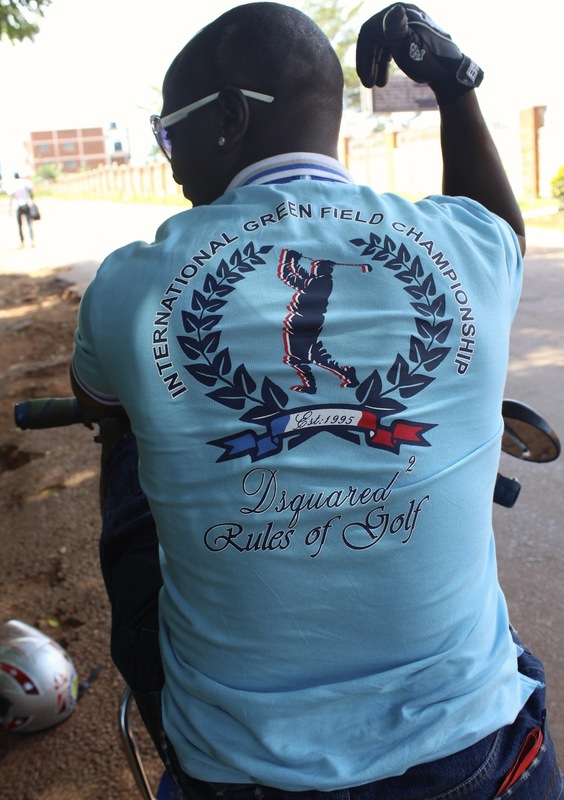 Mike was sporting a shirt from the International Green Field Championships, which he also purchased at Owino. 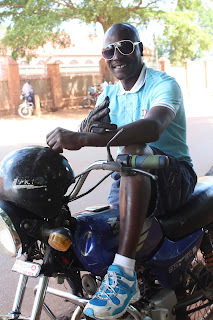 As for his oversized 60s style sunnies, well the author of this blog would love to think this was definitely a case of style over necessity, but no. At least Mike is aware of the harsh realities of his job, and he does appreciate nice things. "(They're) for protecting all my eyes (ed - how many does he have?) 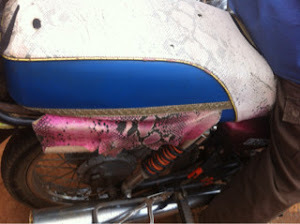 so I'm not getting any dust in and even the fashion is not bad," Mike says. But it's actually his two tone blue shirt (see below) that he's most proud of. "The shirt was 8,000, that's not bad. Not ten, eight," emphasises Mike, who also wears one ear stud (just one), on his right ear. "I like the colour. For week days I put on blue and for for weekends white." As my mother would ask, how on earth does he keep them clean??? So proud of his one glove. But even prouder of this shirt, his fave. 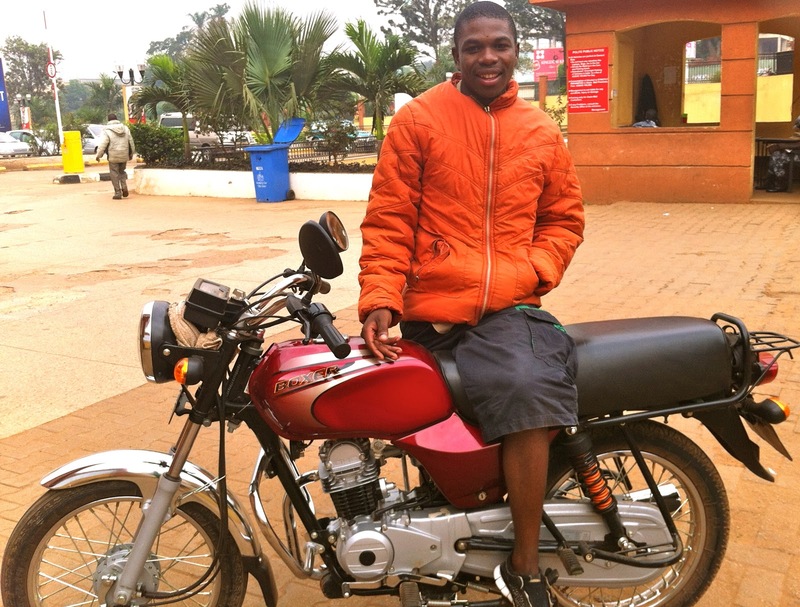 As for work, well it appears that being a motorbike taxi in Kampala may still be better than digging ditches (although we're yet to have this confirmed). 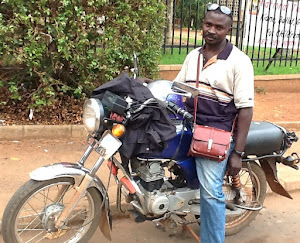 "The boda job is not bad," admits Mike, who earns about 50k on an average day but must pay 15k to the man he rents his bike from. 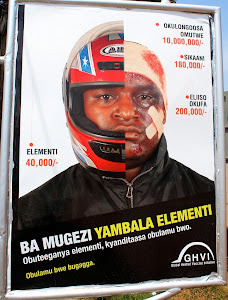 "With bodaboda you can get some little money. I like it, I like my job. I save 10k (a day). 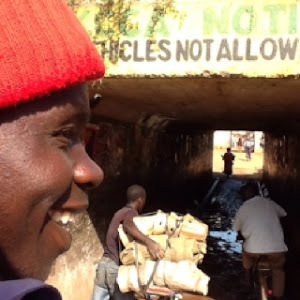 "(But) if it's raining (like today) there are few customers because they're fearing (the wet)." 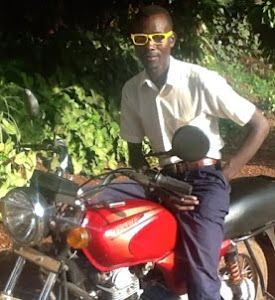 So in other words boda drivers, make hay while the sun shines. 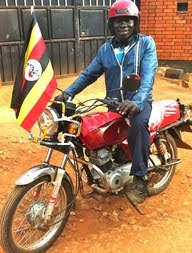 We wish Mike well on his search at Owino for a pair of gloves this Saturday, and hope he won't go home empty-handed (so to speak). 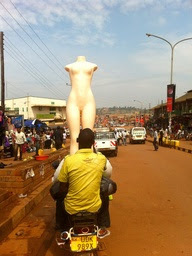 Maybe Bodaboda Baby should go with him to look for a Wallabies jersey? 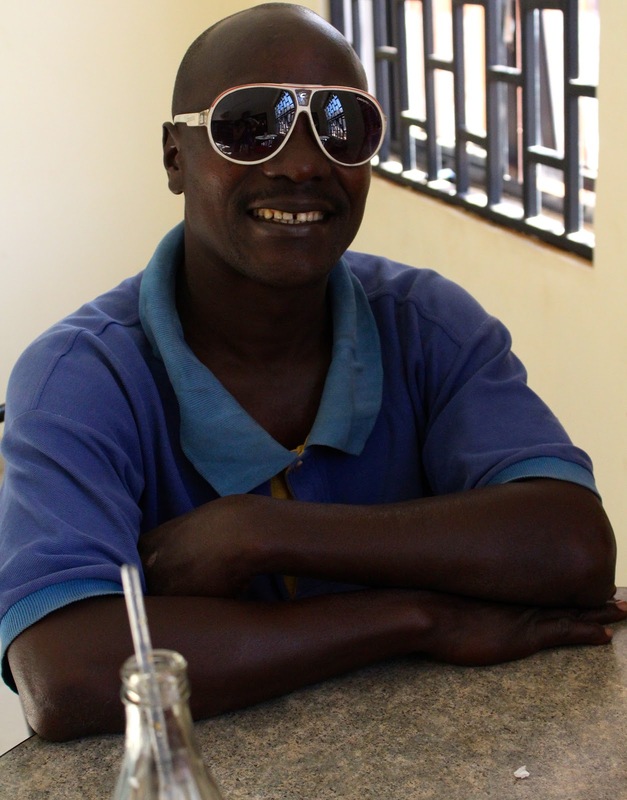 Unsurprisngly, Mike is a bit of a 'mzungu's man' , at least when it comes to customers. The author of this blog has discovered, through the Bodaboda Baby fan page, that a friend, Mark, is also a regular client. 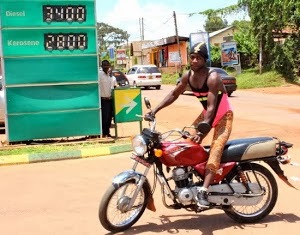 This isn't the first time that Bodaboda Baby has discovered only two degrees of separation between herself and a boda. 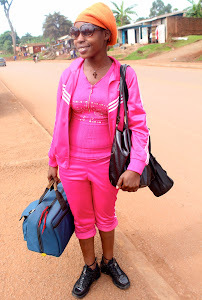 Her former neighbour Dennis, who works at Makerere stage, is also a regular chauffeur to aspiring photographer Dani, who used to live in her old place (although not at the same time as her). 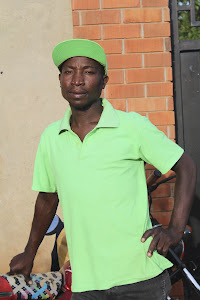 The author of this blog has discovered that Dani, with whom she has mutual friends, is also a former regular customer of Julius', another ex driver. The perennially smiley Dennis. Post on him coming soon. 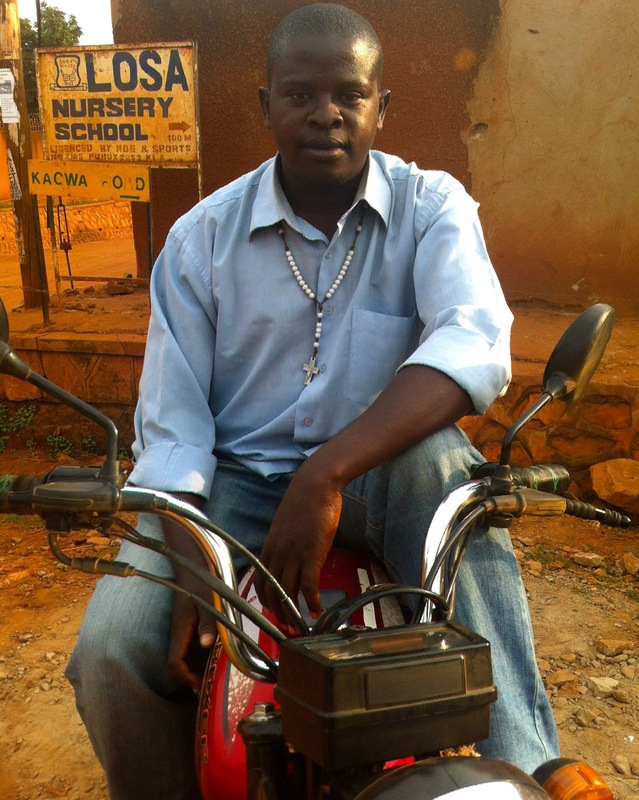 In fact Dani says of Dennis, "He's a great friend of mine One of my favorite people in Uganda for sure". Julius, former chauffeur of yours truly, and Dani. 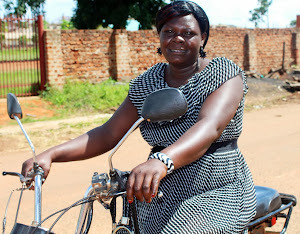 Dani, who has started the Facebook page Portraits of Kampala, has created a Boda Madness album which include these terrific shots of some very special passengers. 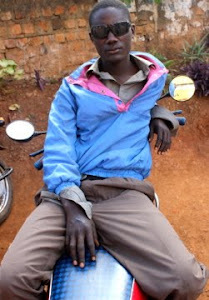 There's also a great image of a nail man - the author of this blog loves a good manicure man, and strangely enough one always seems to pop up near her. 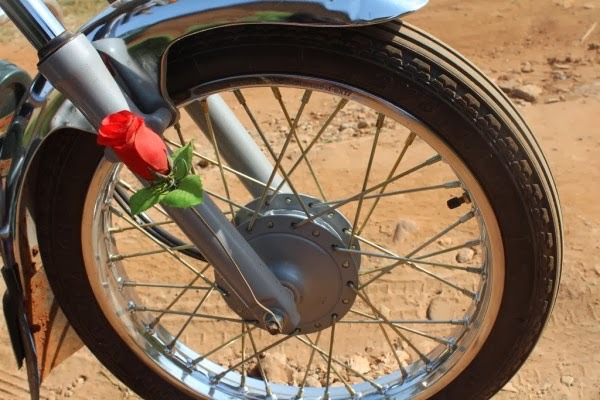 Until next time, stay safe on the road. 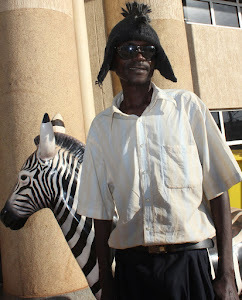 Oh, thanks also to The Coffee Bar at Bugolobi for sponsoring this post, kind of. If you look closely, second from the bottom, The Coffee Bar is offering "muphins". Move over Mr. Tasty. Have you heard of Taste Budz, situated not far from The Coffee Bar?